Preheat oven to 400 °F. Season sea bass with salt and pepper. Heat a sauté pan, and sear sea bass on each side 2-3 minutes or until golden brown. Finish in the oven, approximately 5 minutes until cooked through. After cooking fish, remove to serving plate. 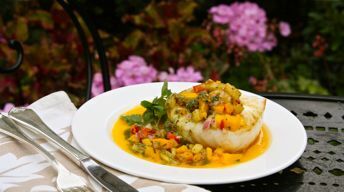 Drizzle with the beurre blanc and top with tropical salsa before serving. Put ginger, shallots, vinegar, and wine in a stainless steel saucepan and bring to a boil. Reduce to ½ cup, add mango puree and simmer over low heat for about 5 minutes. Strain mixture through a fine mesh strainer. Return all the liquid to the stainless steel pan and place over low heat. Whisk the cold butter into the liquid, piece by piece. Season with salt and white pepper. Combine all ingredients and season to your liking.